Abstract: Firewalls are a necessity, but configuring them so that every internet-based program still works is often troublesome. With this guide, you can have your Firewall, and MSN File Transfers too. Today's Internet is a dangerous place for your computer; there's just no denying it. A few years ago you could happily go about your business on the web without any form of protection, and still face only a slim chance of being virus infested, hacked or otherwise interfered with. These days it's practically impossible. There are vast amounts of viruses and malware infections moving through the Internet daily, many of which need no prompting or permission to infect an unprotected computer. To prepare yourself for today's Internet environment, you need the holy trinity of computer security: effective antivirus/anti-spyware software, regular updates and a firewall. We'll be looking at the latter today, in detail. In this guide, we will walk you through every procedure involved in setting up and configuring a hardware or software firewall to protect your computer or network. We will also cover how to circumvent the problems firewalls can often cause to applications, and tackle the issue of hosting a game, web or FTP site on a firewall protected system. 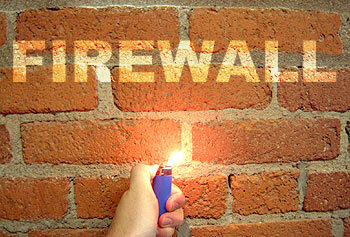 In short, this should be the last firewall article you'll need to read. As for the first article you should read, our original guide to firewalls and Internet securitycontains more information on how firewalls work and the kind of threats you face on the web. First things first, let's look at installing and configuring three of the most common types of firewall; the Windows XP firewall that is built into each copy of the operating system, Zone lab's popular Zonealarm firewall software, and a typical home Internet sharing device (router) firewall. Any of these three will provide excellent defence for your system once activated, but each requires different care and feeding techniques. Microsoft's decision to include Firewall software with their newest operating system was a logical maneuver at the time. Customers were realizing that the Internet was not a safe place to be, and some of the 'features' of Windows XP's ancestor, Windows 2000 made un-firewalled systems very vulnerable to attack. As Windows XP was based on the same technology as Win2K, Microsoft needed to add something. A mechanism that would compensate for the fact that they could not always rely on home users keeping up with the patches and updates necessary to protect their computers. A software firewall was the obvious answer. Of course, sometime close to release, Microsoft realized the havoc that would be caused if XP shipped with the firewall activated. Many Internet applications would not work unless users configured the firewall to allow them. Thus the decision was made to include the firewall only as a 'feature' that needed to be activated to be of any use. Service Pack 2 for Windows XP finally makes the firewall an integral part of Windows XP and activates it by default, but if you are using a pre-SP2 version of XP, it is necessary to set the software up manually. The Windows XP firewall is a software or personal firewall, meaning that it runs on a single computer and protects only that system. If the computer in question is using Internet sharing to provide the rest of a home network with Internet access, then the firewall will protect the entire network.